The yellow metal declined slightly late Wednesday as minutes of the Jan 29-30 FOMC meeting conveyed a less dovish message than anticipated by the market and triggered a positive reaction for USD buyers. The report hinted for Fed’s rate hold amid uncertain economic outlook but also conveyed that several participants saw further rate-hikes being appropriate in 2019. On the other hand, uncertainty surrounding the US-China trade talks considering tough demands from the US, coupled with Brexit threat will most likely keep highlighting Gold’s demand for risk aversion. After surging to a ten-month high of $1346.61 per ounce, Gold prices reversed failing to hold above the $1341.17 key support level. 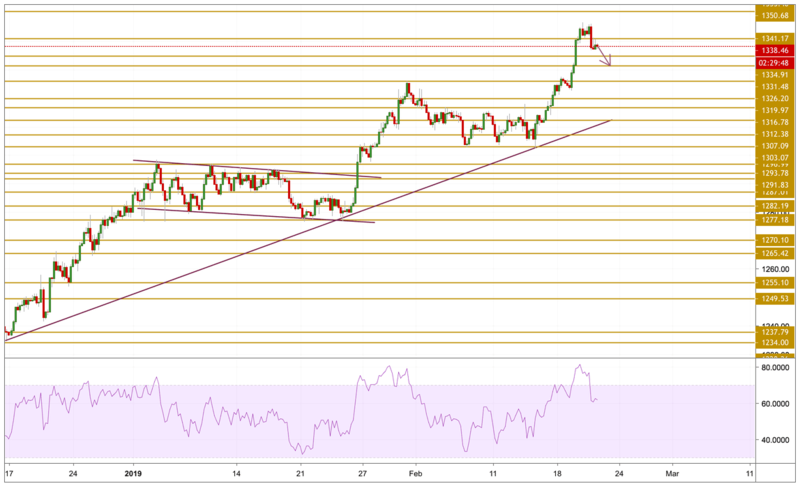 The price is currently hovering around the $1338 level after retreating from overbought conditions as indicated by the RSI. From a technical perspective, gold looks set to extend the pull down towards and test near support levels at $1331.48.